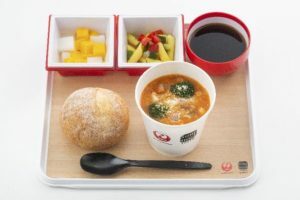 Japan Airlines (JAL) and Soup Stock Tokyo Co., Ltd. today announced their newest inflight meal, which will be served in Premium Economy and Economy Class for flights to Europe, North America, and Australia starting December 1, 2018. This will be the fifth installment since the two companies` collaborated to create “Air Soup Stock Tokyo” in December 2014. For this edition, JAL will be serving a warm minestrone soup using carefully selected sweet tomatoes grown in southern Italy with white kidney beans and bacon. Please enjoy this limited time menu from JAL & Soup Stock Tokyo during your next flight from Japan.